Had an op myself, my wife and mum have here as well. Great service all round, would definitely like to go back if ever needed. 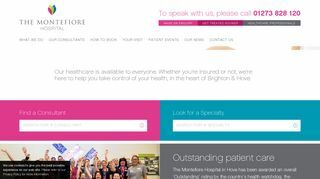 I got referred for a ultrasound by BUPA healthcare as a precaution and I was given 3 hospitals to choose from and I am so glad I chose the Montefiore spire in Hove east Sussex. From the moment I contacted them by telephone they were effecient and professional, i explained my position and the urgency due to me travelling overseas next week I asked could they squeeze me in today or tomo (i requested a 48 hour window) they made my appointment for the Friday morning at 09.00 and I saw a radiologist doctor who scanned me and told me I was all okay which is obviously a big relief if you have a concern. The Dr/consultant checked me over and then explained everything to me in detail which was informative and reassuring, this sort of service is no doubt life saving in more critical instances and I really applaud these guys, cannot give their service and facilities at the hospital any more credit they are top notch.